Thank you, PM PV Narasimha Rao for choosing a constituency from Odisha for your reelection to Lok Sabha. It is an honour for Odisha that you chose this one, in addition to the one which returned you to become the Prime Minister in the previous term. People were waiting for your decision in bated breath and you chose our Berhampur Lok Sabha constituency. Rahul Gandhi born 19 June, 1970 is an Indian politician. He hails from a long line of politicians, known as the Nehru-Gandhi family, which has occupied a prominent place in the politics of India ever since the country gained independence in 1947. The son of Sonia and Rajiv Gandhi, he is the President of the Indian National Congress and serves such additional offices as the Chairperson of the Indian Youth Congress and the National Students Union of India. A member of the Indian Parliament, Gandhi represents the constituency of Amethi, Uttar Pradesh in the 16th Lok Sabha. Gandhi stayed away from the public sphere for much of his childhood and early youth; he attained primary education in New Delhi and Dehradun but was later homeschooled because of security concerns. He later attended Rollins College under a pseudonym, his identity being known only to a select few individuals, which included certain university officials and security agencies. After obtaining degrees in International Relations and Development Studies at the universities of Rollins and Cambridge, Gandhi worked at the Monitor Group, a management consulting firm in London. He established the Mumbai-based technology outsourcing firm, Backops Services Private Ltd.
Gandhi entered politics in 2004 and successfully contested the general elections held that year from Amethi, a seat that was earlier held by his father; he won again from the constituency in 2009 and 2014. Amidst calls from Congress party veterans for his greater involvement in party politics and national government, Gandhi was elected Congress Vice-President in 2013, having served as the General Secretary previously. Gandhi led the INC’s campaign in the 2014 Indian general elections; the party suffered its worst electoral result in its history, winning only 44 seats compared to 206 seats won previously in the 2009 general election. As of May 2018, Gandhi trails behind incumbent Prime Minister of India Narendra Modi as the popular choice for Prime Minister in the 2019 general elections. Gandhi took over as the president of the Congress in December 2017. He is also a trustee of Rajiv Gandhi Foundation and Rajiv Gandhi Charitable Trust. Gandhi was born in Delhi on 19 June 1970, as the first of the two children of Rajiv Gandhi, who later became the Prime Minister of India, and Italian-born Sonia Gandhi, who later became President of Indian National Congress, and as the grandson of the then Prime Minister Indira Gandhi. His paternal grandfather Feroze Gandhi was a Parsi from Gujarat. He is also the great-grandson of India’s first Prime Minister, Jawaharlal Nehru. Priyanka Vadra is his younger sister and Robert Vadra is his brother-in-law. He identifies himself as a Hindu Brahmin. Gandhi attended St. Columba’s School, Delhi before entering The Doon School in Dehradun, Uttarakhand from 1981 to 1983. Meanwhile, his father had joined politics and became the Prime Minister on 31 October 1984 when Indira Gandhi was assassinated. Due to the security threats faced by Indira Gandhi’s family from Sikh extremists, Rahul Gandhi and his sister, Priyanka were home-schooled thereafter. Gandhi joined St. Stephen’s College, Delhi in 1989 for his undergraduate education but moved to Harvard University after he completed the first year examinations. In 1991, after Rajiv Gandhi was assassinated by the Tamil Tigers (LTTE) during an election rally, he shifted to Rollins College in Florida, USA, due to security concerns and obtained his B.A. in 1994. During his time at Rollins, he assumed the pseudonym Raul Vinci and his identity was known only to the university officials and security agencies. He further went on to obtain an M.Phil. from Trinity College, Cambridge in 1995. After graduation, Rahul Gandhi worked at the Monitor Group, a management consulting firm, in London. In 2002, he was one of the directors of Mumbai-based technology outsourcing firm Backops Services Private Ltd. While in 2004, Gandhi had told the press that he had a Spanish girlfriend, an architect, living in Venezuela, whom he had met while studying in England. In 2013, he suggested that he may not get married. In March 2004, Gandhi announced his entry into politics by announcing that he would contest the May 2004 elections, standing for his father’s former constituency of Amethi in Uttar Pradesh in the Lok Sabha, India’s lower house of Parliament. His mother had held the seat until she transferred to the neighbouring seat of Rae Bareilly. The Congress had been doing poorly in Uttar Pradesh, holding only 10 of the 80 Lok Sabha seats in the state at the time. At the time, this move generated surprise among political commentators, who had regarded his sister Priyanka as being the more charismatic and likely to succeed. It generated speculation that the presence of a young member of India’s most famous political family would reinvigorate the Congress party’s political fortunes among India’s youthful population In his first interview with foreign media, Gandhi portrayed himself as an uniter of the country and condemned “divisive” politics in India, saying that he would try to reduce caste and religious tensions. Gandhi won, retaining the family stronghold with a victory margin of over 100,000. Until 2006 he held no other office. Gandhi and his sister, Priyanka managed their mother’s campaign for re-election to Rae Bareilly in 2006, which was won with a victory margin of over 400,000 votes. He was a prominent figure in the Congress campaign for the 2007 Uttar Pradesh Assembly elections; Congress, however, won only 22 seats of the 403 seats with 8.53% of votes. Gandhi was appointed General Secretary of the All India Congress Committee on 24 September 2007 in a reshuffle of the party secretariat. In the same reshuffle, he was also given charge of the Indian Youth Congress and the National Students Union of India. In 2008, senior Congress leader Veerappa Moily mentioned “Rahul-as-PM” idea when the PM of India Manmohan Singh was still abroad. He was elevated to the position of the vice-president of the party in January 2013. In September 2007 when he was appointed general secretary in charge of the Indian Youth Congress (IYC) and the National Students Union of India (NSUI), Gandhi promised to reform youth politics. In his attempt to prove himself thus, in November 2008 Gandhi held interviews at his 12 Tughlak Lane residence in New Delhi to handpick at least 40 people who will make up the think-tank of the Indian Youth Congress (IYC), an organisation that he has been keen to transform since he was appointed general secretary in September 2007. In the 2009 Lok Sabha elections, Gandhi retained his Amethi seat by defeating his nearest rival by a margin of over 370,000 votes. Gandhi was credited with the Congress revival in Uttar Pradesh where they won 21 out of the total 80 Lok Sabha seats. He spoke at 125 rallies across the country in six weeks. The nationwide elections defied the predictions made by pre-poll predictions and exit polls and gave a clear mandate to the incumbent Congress-led UPA government. In May 2011, Gandhi was arrested by the Uttar Pradesh Police at Bhatta Parsaul village after he turned out in support of agitating farmers demanding more compensation for their land being acquired for a highway project. Gandhi was taken away from the protest site and later given bail and dropped off at the Delhi-UP border. Gandhi campaigned during the 2012 Assembly elections in the politically crucial Uttar Pradesh election for almost two months, holding 200 rallies. However Congress ranked as the fourth party in the state, winning 28 seats, an increase of six seats from the previous 2007 elections. Out of the 15 seats in the Amethi parliamentary constituency, Congress won two. Congress activists defended the result in Uttar Pradesh, saying “there’s a big difference between state elections and national polls and in the end there is only the first family, a hope and a prayer”, and pointing out the turn around attributed to Gandhi in the 2009 Lok Sabha national elections in the state. However, Rahul Gandhi publicly accepted responsibility for the result in an interview after the result was declared. In the Gujarat assembly elections held later in the year, Gandhi was not made the head of the election campaign. This was seen and regarded by opponents as an admission of defeat and was termed as a tactic to avoid blame of defeat. Congress won 57 seats in the assembly of 182, which was 2 less than the previous elections in 2007. Later in bypolls, Congress lost 4 more seats to BJP. Gandhi contested the Indian general election, 2014 from his constituency, Amethi. and led the election campaign of the Indian National Congress. Gandhi held the Amethi seat by defeating his nearest rival, BJP’s Smriti Irani, by a reduced margin of 107,000 votes. Under his leadership, the Indian National Congress suffered its worst ever performance in elections and won only 44 seats compared to 206 seats won previously in the 2009 general election. The Congress-led electoral alliance, the UPA also had its worst ever performance in elections and won only 59 seats compared to 262 seats won previously in the 2009 general election. After the defeat, Gandhi offered to resign his posts, only to be rejected by the party’s working committee. He mocked the government as “suit-boot government”, a reference to Modi’s monogrammed suit which he wore in the Republic Day meeting with Barack Obama. Moreover, he used the “acche din government” jibe (which was Modi’s election campaign slogan meaning “good days government”) and mentioned that it had “failed the country”. Gandhi coined the slogan “Chowkidar Chor Hai” as a jibe against Narendra Modi, BJP’s Prime Ministerial candidate for the 2019 Indian general election. The slogan was aimed at Modi in relation to the alleged irregularities and favouritism in the Rafale fighter jet deal. The government has denied any wrongdoing in the Rafale deal and the case is being heard by the Supreme Court of India. with Rahul Gandhi at the Roosevelt House in New Delhi. In December 2010 during the United States diplomatic cables leak, WikiLeaks leaked a cable dated 3 August 2009, where the Prime Minister of India, Manmohan Singh had hosted a lunch on 20 July 2009 for Rahul Gandhi, then the General Secretary of the AICC. One of the guests who was invited for the lunch was the United States Ambassador to India, Timothy J. Roemer. In a “candid conversation” with Roemer, he said that he believes Hindu extremists pose a greater threat to his country than Muslim militants. Rahul Gandhi referred specifically to more-polarising figures in the Bharatiya Janata Party. Also responding to the ambassador’s query about the activities in the region by the Islamist militant organisation Lashkar-e-Taiba (LeT), Rahul Gandhi said there was evidence of some support for the group among certain elements in India’s indigenous Muslim population. In a response to this, the BJP heavily criticised Rahul Gandhi for his statements. BJP spokesperson Ravi Shankar Prasad slammed Rahul Gandhi, saying that his language was a bigger threat to India, dividing the people of the country on communal grounds. Speaking to reporters, Prasad said, “In one stroke Mr. Rahul Gandhi has sought to give a big leverage to the propaganda to all the extremist and terrorist groups in Pakistan, and also some segments of Pakistani establishment. It would also seriously compromise India’s fight against terror as also our strategic security.”Adding that terrorism has no religion, he said that Rahul Gandhi had shown his lack of understanding India. Gandhi has also been critical of groups like the RSSand has compared them to terrorist organisations like SIMI. After the 2013 Muzaffarnagar riots, at a Madhya Pradesh election rally in Indore, Rahul Gandhi claimed that a police officer has told him that Pakistan’s ISI was trying to recruit disgruntled riot-affected youngsters. However, the district administration, the UP state government, the Union Home Ministry, the Research and Analysis Wing (RAW) and the Intelligence Bureau (IB) denied any such development. This remark drew heavy criticism from various political outfits such as BJP, SP, CPI and JD(U). Congress’s Jairam Ramesh said Gandhi needed to apologise to the Muslim community for this remark. In reply to the ECI’s show-cause notice to explain why action should not be initiated against him for violating the Model Code of Conduct, Gandhi said that he didn’t intend to exploit communal sentiments but was referring to divisive politics. The BJP also asked the government to explain why Gandhi, who holds no post in the government, is being briefed by intelligence officers on important security issues. On 13 November 2013, Election Commission of India finding Gandhi’s explanation to be insufficient conveyed its displeasure and advised him to be more circumspect in his public utterances during election campaigns. Rahul Gandhi opines that the Lokpal should be made a constitutional body and it should be made accountable to the Parliament, just like the Election Commission of India. He also feels that Lokpal alone cannot root out corruption. This statement came out on 25 August 2011, on the 10th day of Anna Hazare‘s fast. This statement was considered as a delaying tactic by the opposition and Team Anna‘s members. It was consequently slammed by prominent opposition leaders Sushma Swaraj and Arun Jaitley. The Parliamentary Standing Committee led by Abhishek Manu Singhvi tabled the Jan Lokpal Bill report in the Rajya Sabha on 9 December 2011. The report recommended the Lokpal to be made into a constitutional body. In response, Hazare attacked Rahul Gandhi, claiming he had made the bill “weak and ineffective”. During a rally in Allahabad, Gandhi said “Poverty is just a state of mind. It does not mean the scarcity of food, money or material things. If one possesses self-confidence, then one can overcome poverty.” The phrase “state of mind” drew sharp criticism with BJP Uttar Pradesh spokesperson Vijay Bahadur Pathak alleging him to be mocking the poor. Oneindia News wrote that he made “economics irrelevant”. Rahul Gandhi, on “the convicted lawmakers ordinance” insisted that the ordinance is “complete nonsense” and “What our government has done is wrong”. This was expressed on 28 September 2013 in a press meet, when Rahul made a surprise visit to a press meet organised by Ajay Maken on the topic. The ordinance, earlier, was cleared by the government to negate a Supreme Court’s judgment that would have led to the ejection of convicted lawmakers. Gandhi has pushed for the empowerment of women. He backed the Women’s Reservation Bill which would allow 33% reservation of all Lok Sabha and state legislative assembly seats for women. This bill passed the Rajya Sabha on 9 March 2010 but has not yet been voted on by the Lok Sabha as of February 2014. Gandhi had backed the repeal of Section 377 of the Indian Penal Code and the decriminalization of homosexuality. Finally the SP-BSP alliance declared today in Lucknow for upcoming Lok Sabha Polls in UP. 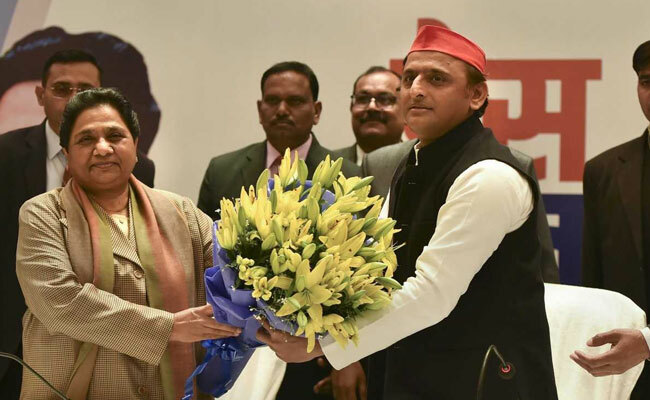 Bahujan Samaj Party chief Mayawati and Samajwadi Party president Akhilesh Yadav announced their alliance in Uttar Pradesh for the 2019 Lok Sabha polls, sharing 38 seats each out of the state’s 80 parliamentary constituencies. The parties kept the Congress out of the alliance, but said they will not field candidates in Amethi and Rae Bareli, represented by Congress president Rahul Gandhi and UPA chairperson Sonia Gandhi. The alliance left two more seats for smaller allies. “The BJP taught us how to do ginti (arithmetic),” said Mr. Yadav on Friday, claiming that despite having a superior record on development, his party had lost out on the arithmetic. Mr. Yadav said the number of alliances stitched up by the BJP to win elections had gone unnoticed. The proximity between the two old rivals, the SP and BSP, started soon after the drubbing in the 2017 Assembly election in which the BJP and its allies secured 325 seats out 403. The BJP played down the potential of the SP-BSP alliance, with CM Yogi Adityanath calling it a “desperate attempt to save their existence.” “Public knows the truth and they will give the reply when time comes,” he said.